Kate Middleton and Prince William couldn’t look happier as they posed for their very first official pictures since the birth of their son, Prince George. The snaps of the Duke and Duchess of Cambridge – and their adorable little one – were taken by Kate’s father Michael Middleton, and released by St James’s Palace last night. 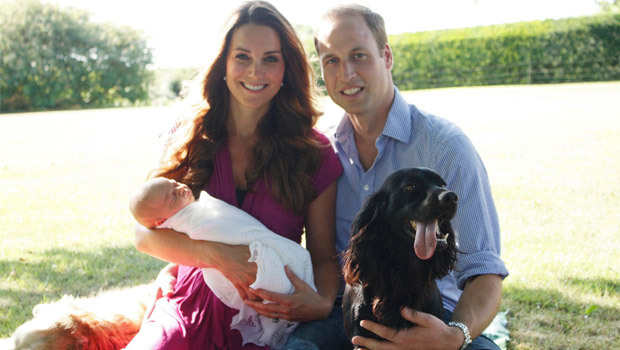 The cutest royal baby pictures EVER?! Looking radiant, happy and healthy, Kate Middleton, dressed in a £46 raspberry-coloured nursing dress by maternity brand Seraphine, beams at the camera and cradles her little one, with Prince William by her side. In one of the shots, the couple sit on a picnic blanket with their cocker spaniel Lupo and the Middletons retriever Tilly, while in another they stand under a tree with sunshine in the background. Meanwhile, little Prince George looks completely oblivious, wrapped in a white blanket and napping in his mother’s arms. The sunny shots were taken in the back garden of the Middleton family home, where Prince William and Kate Middleton stayed for two weeks after the birth of their son. It’s thought Prince William and Kate Middleton took the decision to release their own personal family photos taken at home, so as not to disrupt Prince George’s routine. Reports suggest the pair were also keen to release an official photo as soon as possible, to disrupt the market for paparazzi snappers. ‘They are a young couple who have just had their first baby and are enjoying time as a family together but, of course, there has been huge demand from the public to see some official photographs of Prince George,’ one royal aide revealed. Yesterday, it was revealed that Kate Middleton and adorable baby George had returned home to Anglesey, accompanied by the royal’s mother, Carole. Kate travelled to the North Wales farmhouse – with her mother in tow – to follow Prince William back to their remote North Wales residence where he is resuming his duties as an RAF search and rescue helicopter pilot. The Duke and Duchess are said to be ‘immensely grateful’ to Carole Middleton who has helped Kate with the care of their new son since they decided not to hire a nanny for Prince George. Who has joined Kate Middleton in Anglsey?